On a weekend in the mission, everyone does brunch. And because we’re not super early birds, by the time we want to go eat brunch, it’s when everyone else also wants to eat brunch. This all leads to long waits. I hate waiting. We attempted to go to Maverick but there was about a 45 minute wait there, so we kept on walking. We walked back to Valencia and saw a sign in front of Frjtz for belgian waffles. I had just mentioned wanting one so we decided to stop here. We had gone here before for dinner and had a great time, so things looked promising. We got a seat outside on this beautiful day. 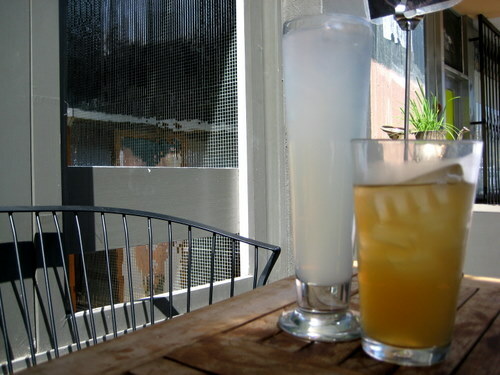 They have fresh lemonade and iced tea. J decided to literally mix it up and ask for a half lemonade, half iced tea, which they obliged. Frjtz does brunch just on the weekend. 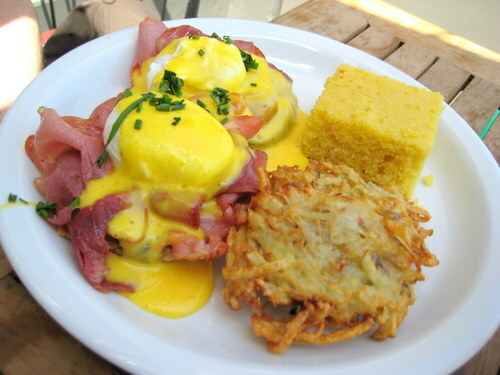 Here’s the Rijks, which is two poached eggs on english muffins with prosciutto and chipotle hollandaise, served with home potatoes and corn bread. J found the prosciutto a bit too much on the salty side, but otherwise enjoyed this dish a lot. I particularly liked the home potatoes, which ended up being like an onion-y home fry fritter. It was really great! And although this cornbread was plain, I still liked it. 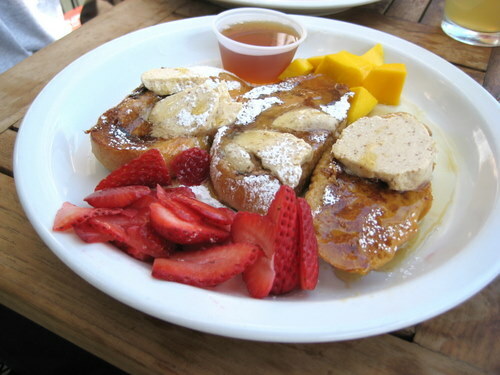 I wanted something a little sweet so I went with le Pompidou, which is brazilian style french toast (rabanada) served with date butter, maple syrup, strawberries, and mango. Whoa, this thing was decadent and delicious and beyond sweet. Everything is super sweet as the ingredients include tons of sweetened condensed milk, straight up sugar, etc. But damn, this is good. And the date butter is extremely rich but worth it. The fruit was also of high quality and especially ripe. Frjtz has never been busy either time I’ve been here. But I’ve enjoyed both my experiences. And hey, I love not having to wait for a table!